AMD will release its 4×4 platform using Athlon 64 FX-2P dual core processors, 4×4 has ability to process four threads using two Athlon 64 FX-2P dual core processors. This technology is an adoption of Symmetric Multi-Processor system of Opteron series processors. The Athlon 64 FX-2P is expected to debut in Nov 2006, which is same as Intel Core Quadro Kentsfield’s release date. These processors are based on windsor core with 2x 1MB L2 Cache and come under 125W TDP category. As the 4×4 platform is high in production cost as well as not much in performance boost, the industry indicates that AMD Athlon 64 FX-2P is just a technology show off product rather that mass production product. It�s no point for a user to spend more while there is a cheaper solution for the same performance. This platform would appear to the OEM like Dell and HP only. 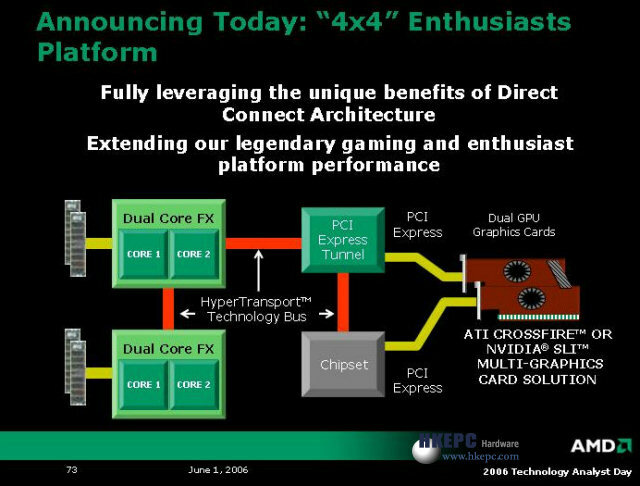 Do you think AMD will be able to make up using 4×4 platform? I feel the native quad core based on K8L architecture looks more promising than the current 4×4 platform. Digit Life’s article on AMD K8L architecture.